Fashion week is one of the most exciting times for fashion and beauty enthusiasts everywhere. Not only do you get to see the up and coming fashion trends, but you also get a sneak peak at what beauty looks are going to start trending. All our favorite designers work side by side with hair stylists, makeup artists and manicurists to create a look that completes their designs. Even though there are so many different designers and unique looks, there were a few beauty looks that seemed to appear on almost every runway. Luminous cheeks and flawless skin were one of the most popular looks during this Fashion Week. Tanya Taylor, Phillip Lim, DKNY, Mara Hoffman, Helmut Lang, Christian Siriano, Carmen Marc Valvo, and Herve Leger were only a few of the many designers who envisioned this particular look for all their models. Kate Spade, Jason Wu and Tibi were all fans of creating their looks with white eyeliner. Tibi opted for a more whimsical, fairytale look and used white eyeliner and a hint of white shadow for her show. Kate spade was a little more daring and chose to use white eyeliner to create extra bold cat eyes. Nicole Miller wasn’t alone when she chose to create a look that incorporated bold violet lips with a simple eye and ombre glitter nails. DKNY chose to pair simple eyes with a bold orange lip at her show. 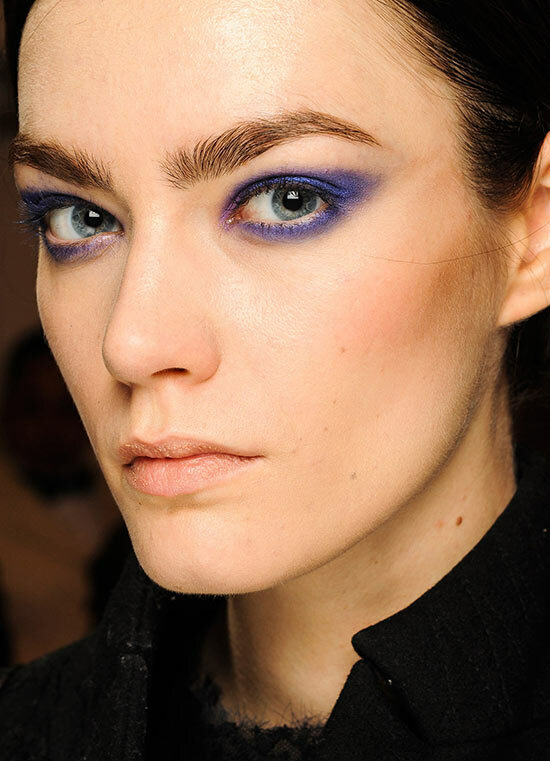 Jason Wu recreated the classic smoky eye with a twist. Instead of using shades of silver or brown, he chose shades of blue.